Ever since the release of the Nexus 7, analysts have wondered what impact, if any, it would have on Android tablets' market share battle with the iPad. The possible release of the iPad Mini, later this year, could throw another wrench into the works. Fortunately, we have already seen an Android vs. Apple battle in the smartphone market. Let's take a look at the parallels we can draw between the smartphone and tablet market and project the possible market share trends in the tablet market. Before we begin, we need to understand the global smartphone market share trends over the past couple of years. It is important to understand that ever since the iPhone and Android were launched, the market was segmented into legacy smartphone platforms (Blackberry, Symbian & Windows Mobile) and modern smartphone platforms (iOS, Android & Windows Phone). We can say this with a certain degree of confidence, as consumers upgrading their smartphones would almost always move from a "legacy" platform to a "modern" platform. Platform shifts, after this change, were almost always within "modern" platforms. Since we have seen that Windows Phone has had practically no impact on the smartphone market, the battle of modern smartphone platforms devolved into the Android vs. iPhone battle we see today. Having understood this, we see that "modern" smartphone platforms are essentially a separate market. So, let's take a look at the quarterly market share in just the iPhone vs. Android smartphone market, since the Android platform was launched (based on Gartner's global smartphone market share figures). 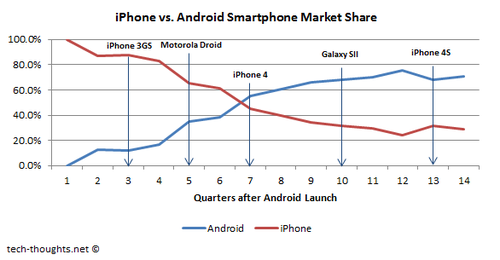 These figures show that Android's smartphone market share overtook the iPhone, 7 quarters after its release. While this pattern is important, it is even more important to understand the reasons behind this. Most analysts look at the smartphone & tablet market exclusively from the perspective of the US market. This is a fairly myopic view, and ignores the larger reasons for the trends prevalent in the smartphone market. While the US market was a major driver of Android's smartphone market share growth in the first few quarters, the primary reason for the sharp growth of the Android platform was strong growth in international markets like Europe and a dominant presence in fast growing, emerging markets like China and South-East Asia. The strength of Android smartphones in these markets was because Android devices were diversified across price points and could effectively target consumers from various income levels. 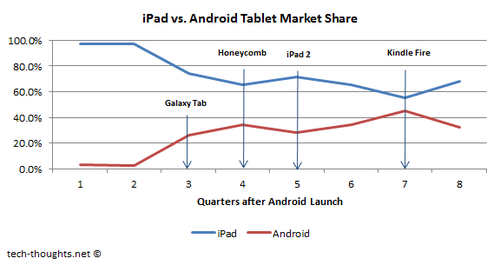 Now let's take a look at the tablet market share trends between Android & the iPad since Android tablets were launched. The first real Android tablet to hit the market was the Samsung Galaxy Tab (in quarter 3 on the chart) and prior to that, we had only products that could be categorized as "phablets", such as the 5-inch Dell Streak. Therefore, quarter 2 in the chart above correlates with quarter 1 in the smartphone market share chart, which represents the Android platform effectively starting from scratch. 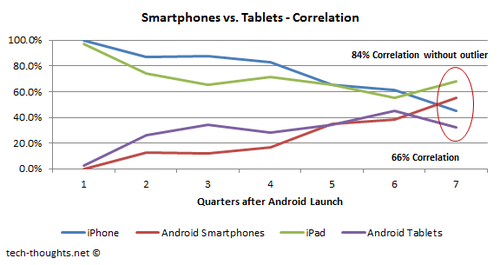 Quarter 8 in the chart above is an outlier when compared to the rest of the tablet & smartphone market share data. This anomaly was caused because there was a huge sequential drop in tablet shipments caused by excess Kindle Fire inventory built up during the holiday season. Now, in most cases, shipment figures are an acceptable substitute for sales figures, but that ceases to be the case when there is a large sequential drop in shipments. According to the NPD Group, this anomaly was restricted to shipments and that actual sales market share in both quarters 7 & 8 was estimated to be somewhere in between both figures. Now let's compare the smartphone and tablet market share trends from the respective release dates of the Android platform against Apple and try and project the future of the tablet industry. This is interesting. The comparison in the chart above shows that the much maligned Android tablets have actually grown market share, against Apple, at a much faster pace than their smartphone cousins. Also, while quarter 7 was the quarter in which Android smartphones overtook the iPhone, it was the same quarter that saw the sequential shipment anomaly in the tablet market. Does this mean that Android tablet market share should overtake the iPad in Q2? Absolutely not, since the new iPad was released in that quarter. Apple's devices always see a share and market share boost around a new launch, thanks to Apple's annual product cycle. However, the market share picture gets more interesting in Q3 with the launch of the Nexus 7, which has proved extremely popular in the market and the upcoming Kindle Fire 2. Based on the figures above, it is easy to see Android tablets overtaking the iPad's market share, with Apple's current strategy, by Q4 of this year. However, Apple's decisions over the next few months could have a major impact on this. Apple seems to be taking the threat of price diversification more seriously this time around. Apple has been rumored to launch an iPad Mini later this year to take on competition from the Nexus 7 and Amazon's upgraded Kindle Fire. However, reports suggest that it is the Nexus 7's 16GB model that has proved far more popular in the market. Apple would have a difficult time getting the price of an 8GB iPad Mini below $299, but getting a 16GB iPad Mini into the market at that price point would be extremely difficult considering the fact that Apple sells the 16GB iPad 2 at $399. From a market share perspective, the best case scenario for Apple would be to launch an 8GB iPad Mini at $249 and a 16GB version at $299. This could give it enough ammunition to compete with the onslaught of low cost tablets from Android. Unfortunately, this may also pressure Apple's margins to the point where it becomes unpalatable to the stock market. The more likely outcome is the launch of an 8GB iPad Mini at $299. Tablet shipments in emerging markets are set to skyrocket next year and Android tablets already have a dominant presence in these markets. 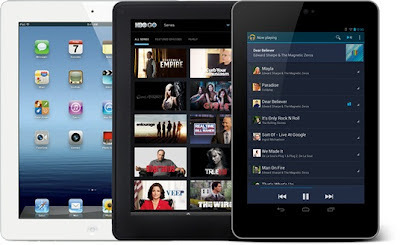 Given this fact, the entry of high quality, low priced tablets like the Nexus 7 would create a huge boom in the international tablet market over the next year and could lead to Android tablets overtaking the iPad in Q2 or Q3 of next year, after the launch of an 8GB iPad Mini at $299. Conclusion - Looking at the early trends in the smartphone market, it is easy to come to the conclusion that Android tablets will eventually overtake the iPad because of their strong presence in emerging markets and pricing advantage. However, the timing of this change of guard will not only hinge on Apple's launch of an iPad Mini, but the pricing strategy they choose to follow. P.S. : This analysis ignores the potential impact of Microsoft's Surface & Windows 8 tablets because I expect them to have a relatively small impact on the market, due to various reasons I have already covered. While the market impact may not be as muted as that of Windows Phone, they will have a very difficult time competing with the iPad and Android tablets, in terms of both pricing & content. Glad to help Jude. And thank you for the comment. B) You say it could offer an 8G iPad mini for $300 (with a bill of materials maybe less than $5 lower). Bigger storage devices give manufacturers much better margin: an extra $5 in the BOM may bring $50 more benefit. So I'd say the $300 iPad mini 16G is the definite possibility, while I don't see a place for the 8G. Customers would get for $50 more than a N7 the very valued Apple brand and what is perceived as better technology and build quality. Though I think Google will sell very many Nexus 7s, I'm sure Apple will be *extremely* successful with this iPad Mini. You brought up some very good points. The problem is that unlike other manufacturers, Apple is much more dependent on large gross margins on their devices. Any sharp cut to Apple's gross margins would hit their stock price hard. The point is Apple should be able to get an 8GB iPad Mini to the market at $299 and maintain a 30-35% gross margin, but they can't sell the 16GB iPad Mini for the same price. It would have to be at least $349 for there to minimize cannibalization, which is a problem when the iPad 2 is priced at $399. I have a lot more to say on this topic, but I already have a couple of posts that explain my stance on the issue.